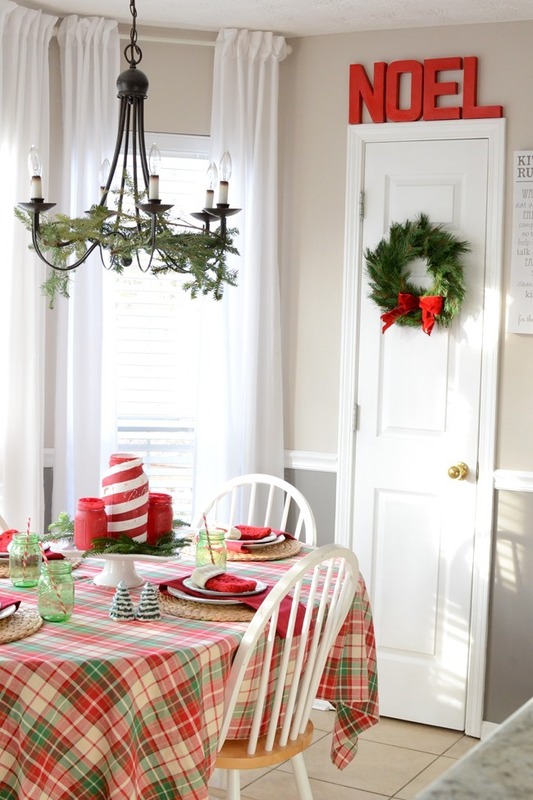 Are you decking the halls yet? I’m just about done and can’t wait to share it all with you! 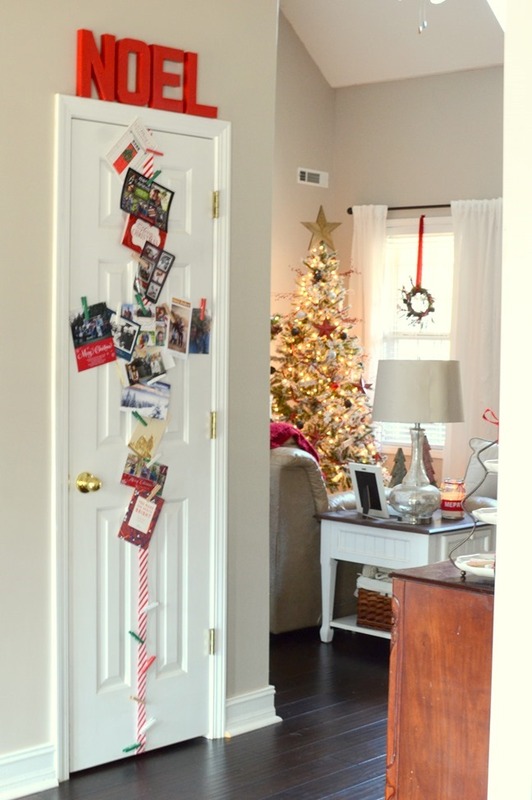 But first I thought I would answer a question that I got several times as I shared sneak peeks of Christmas decorating which was how I choose a theme for my Christmas decor or how I change things up each year without buying all new decor. I thought that was a great question and perfect to ponder whether you have already decked the halls but maybe thinking ahead to some things you might want to add or change for next year or whether you haven’t started decorating and trying to figure out how to go about this year. 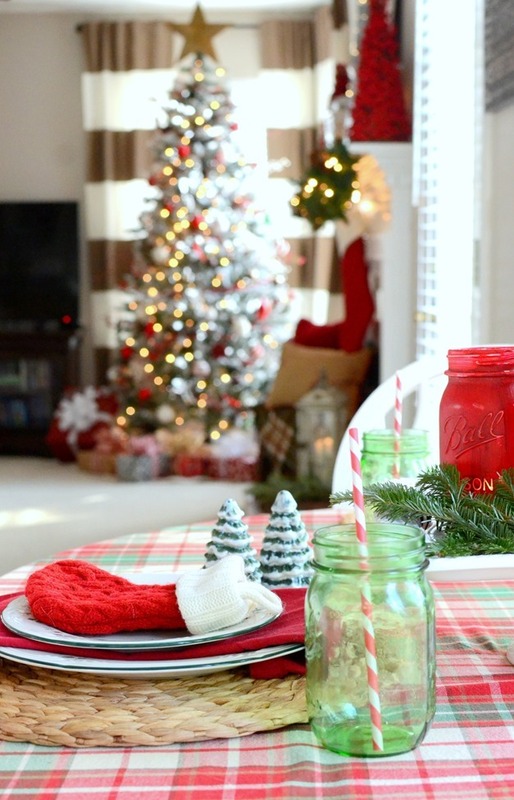 So I will first walk you through 6 years of my past Christmas decor and then share sort of my thought process as I go into a new Christmas season. 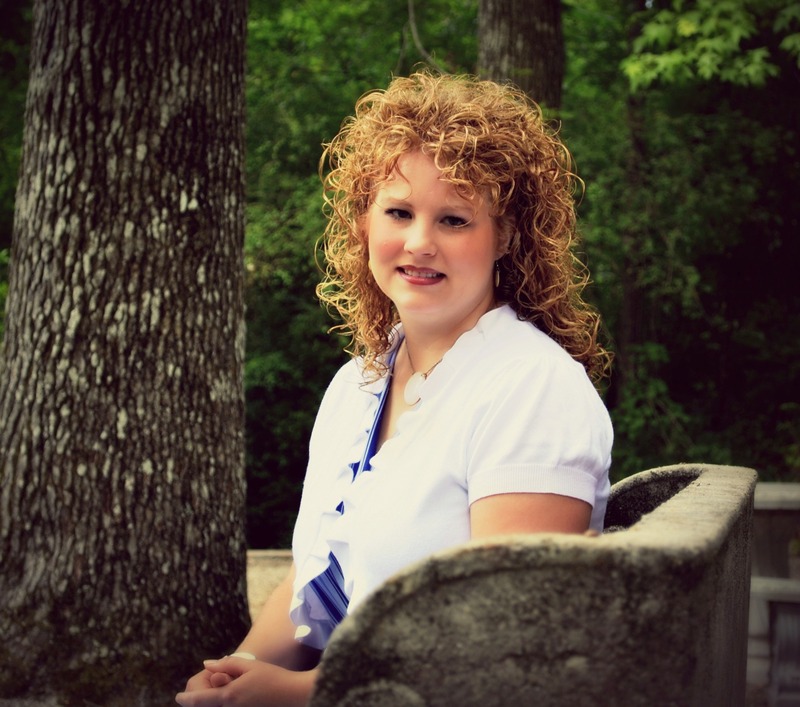 I actually started blogging in 2011 but those Christmas photos are quite…ummm…interesting, let’s just say. 🙂 Wow, not sure what happened between 2011 and 2012, but I am so glad it did! Honestly I think I got a new camera right before Christmas in 2012 and which made a huge difference, but also I really learned a lot about decorating as I followed blogs/read magazines and noticed store displays that year as I began my journey of blogging. So for this year of decorating, I went into it thinking I was going to do an all neutral/no-red Christmas. I know this is really trendy now but don’t think it was as much back then. 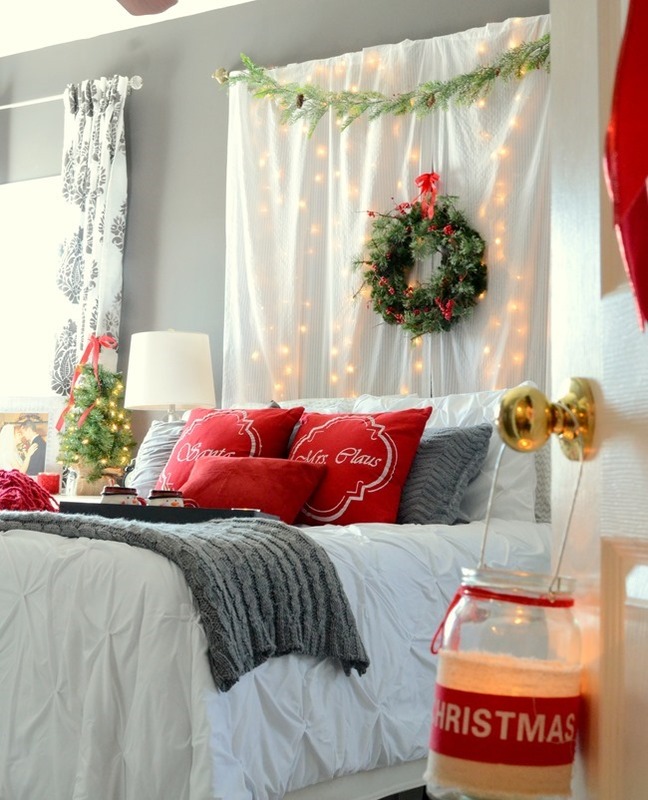 I did love this look but there is just something about Christmas red that just invokes all the Christmas feelings! The next year obviously I was missing the red from the previous year so lots of red and I think I called it a JOYful mantel. 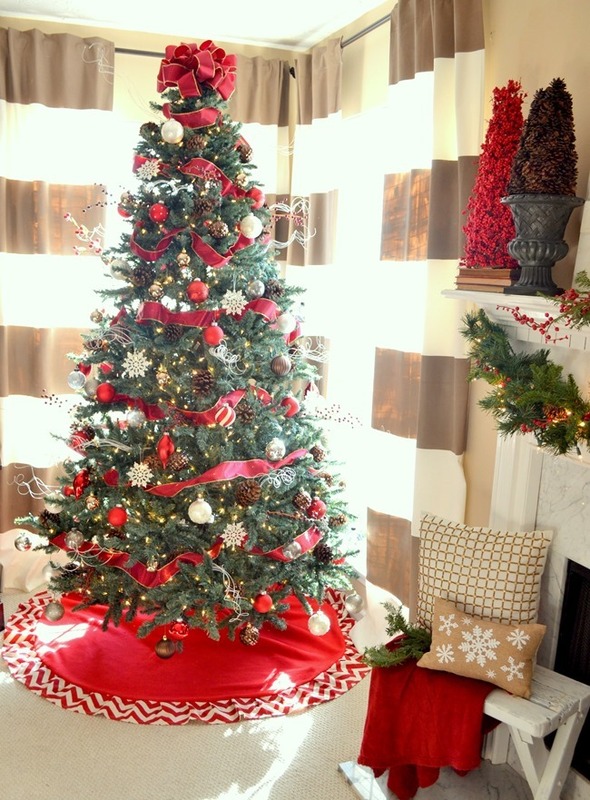 See how I am reusing the white feather tree and pinecone tree but by adding in red it changes the whole look. 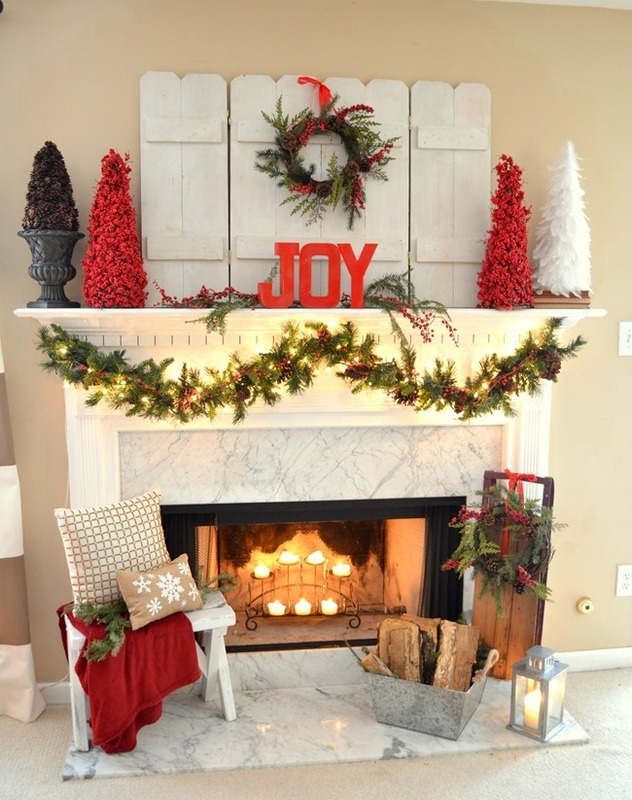 I found that planked backdrop and sled at thrift stores that year so they became focal points in my decor that year. The JOY letters are just basic paper mache letters you can get at any craft store that I spray painted with gloss red spray paint. I reuse those letters every single year someplace – a lot of years they end up up above a door frame or tucked on a shelf. I even made another set that says NOEL because I loved them so much. You’ll see both of them in our home this year for Christmas too! The tree that year was a red, brown, white theme again with berries and pinecones added in. I also made another tree skirt adding a bit of red/white chevron to the decor. Same brown, white and snowflake ornaments from the year before just with red ribbon and red ornaments added. 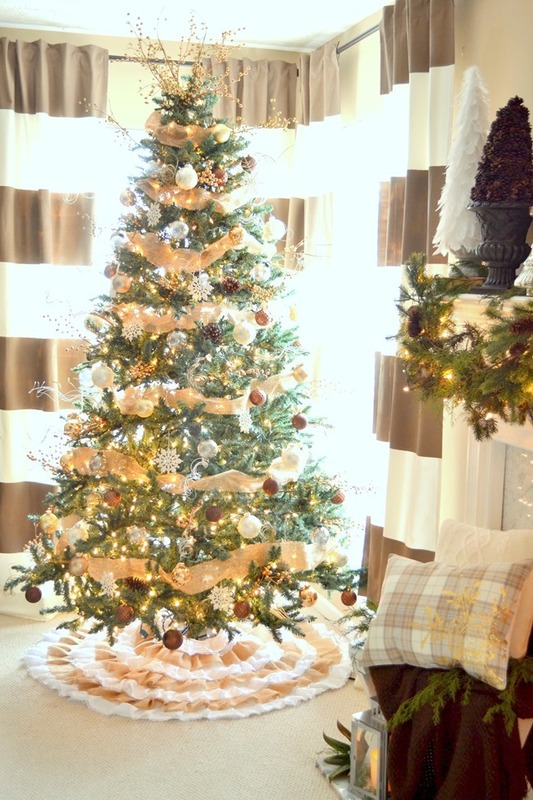 I put the focus a bit more on brown the next year – once again with another tree skirt (this one was a clearance find). And I didn’t realize it but look how almost identical the mantel is yet still different. The focal piece that year was a DIY art made from a gift bag and a thrifted frame spray painted red. No white ornaments on the tree that year, but same red, brown ornaments with some of the gold from the first year added. I also did a plaid ribbon on the tree to sort of combine the red and rustic colors and elements. 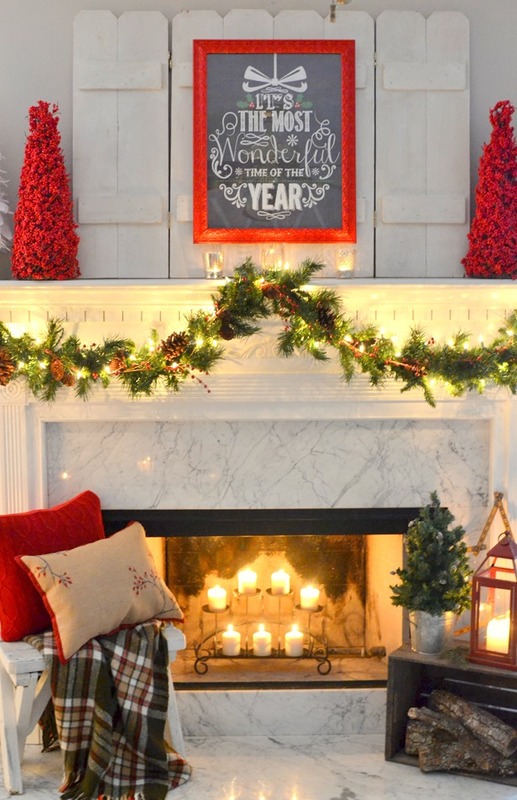 Again very similar mantel arrangement with the red trees and backdrop, but I changed out the focal piece with another DIY piece – a lighted canvas! The tree that year completely changed because the year before I scored a flocked tree at Walmart for 1/2 off after Christmas! They still carry the same brand/type here and it’s very reasonably priced for a flocked tree(especially if you can score it on clearance after Christmas!). I still love and use mine 4 years later (although not many of the prelit lights work anymore). Same red and white ornaments and berries with a new wood star and red berry garland added. 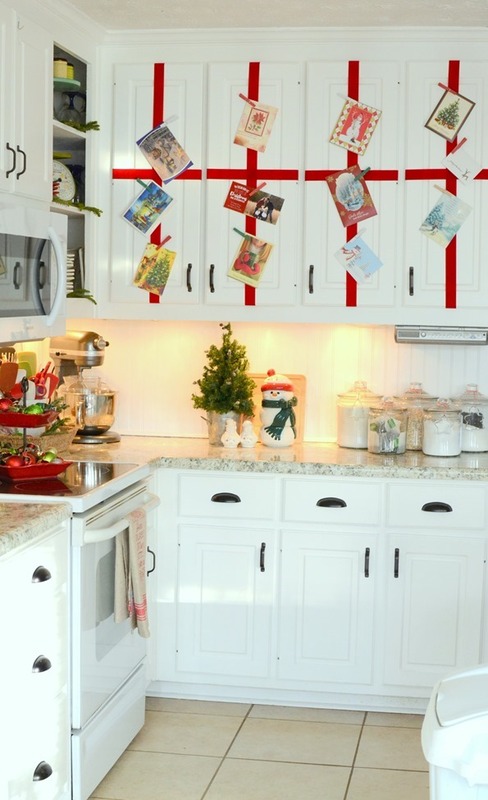 Even if I had bought that tree new that year see how you can reuse so much of past decor with just one new piece to help stretch your dollar. We listed our house for sale days after Christmas that year and those Christmas pictures of our home are my absolute favorite and best. Every bit of our home was decorated that year including the kitchen and our bedroom. So the next year I had a total blank slate to decorate since we were in our new home, which always changes things up. My mantel and fireplace wall in this house is huge and tall which can be a challenge. 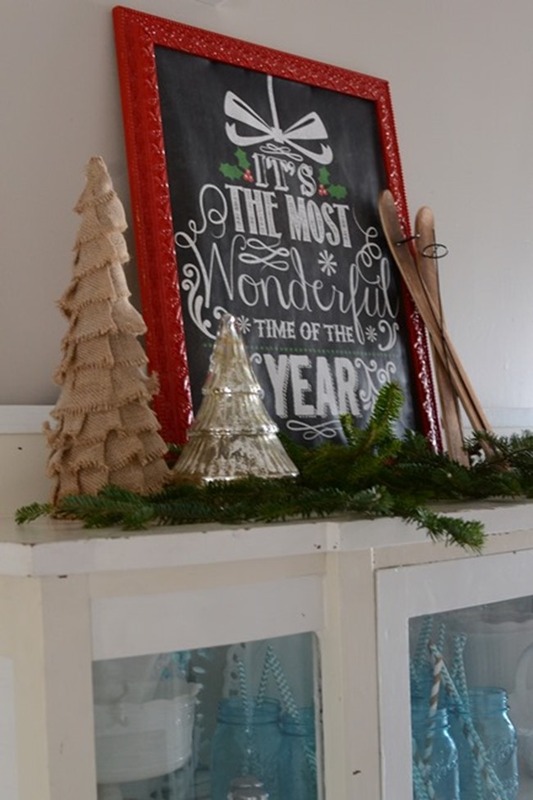 But I did a simple farmhouse Christmas theme that year reusing some wood shutters I had made for a fall mantel at our old house. I also found several flocked wreaths the year before on clearance so adding more flocked greenery started happening. 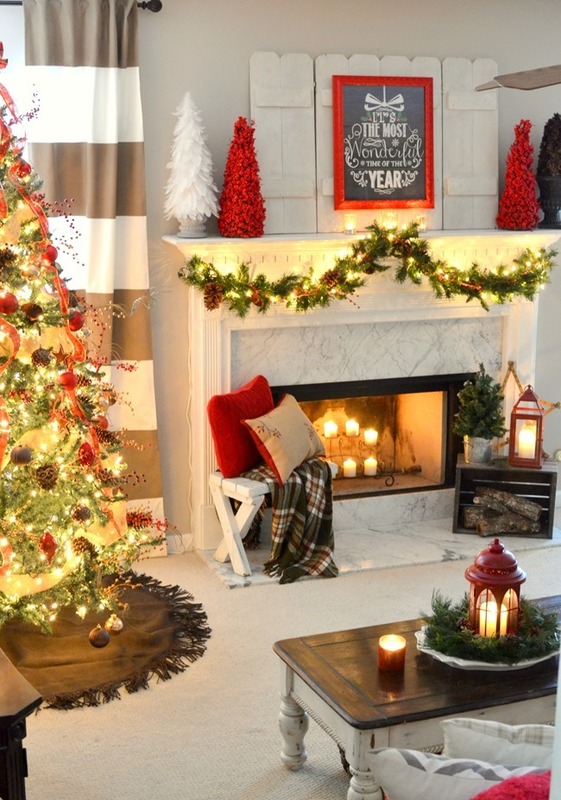 See the same red berry tree too – but down on the hearth this time instead of the mantel. The tree stayed pretty much the same – red, white ornaments, berry garland and picks but this year I added black too. See there’s those NOEL letters again… I know sometimes it is easy to get comfortable and maybe stuck in a rut with thinking a certain decor piece goes in this one spot. Sometimes just moving it around and using it in a different spot or different way makes all the difference! I’m using those letters totally differently this year (and even outside!) and it’s just fun to come up with what feels like “new” decor but not cost you a penny. 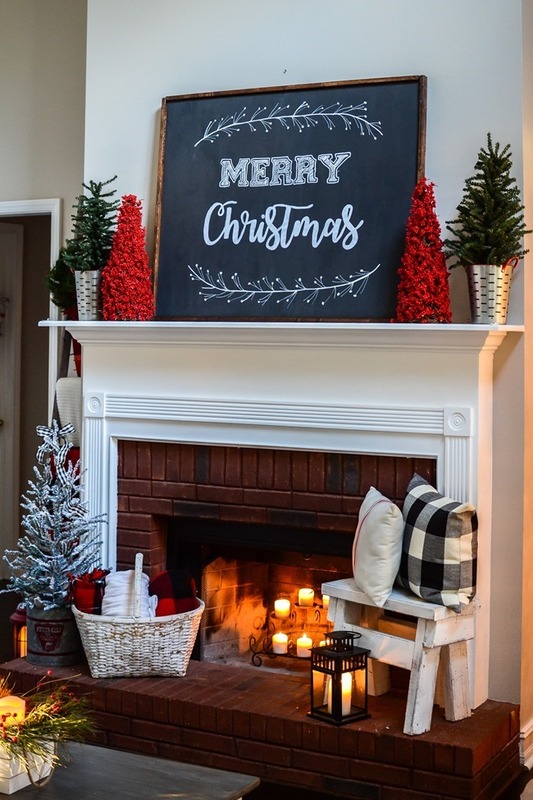 After Christmas last year I flipped that sign over and added faux shiplap to the back so you’ll see that same piece on the mantel this year (and did for fall and other season earlier this year) but just the opposite side. 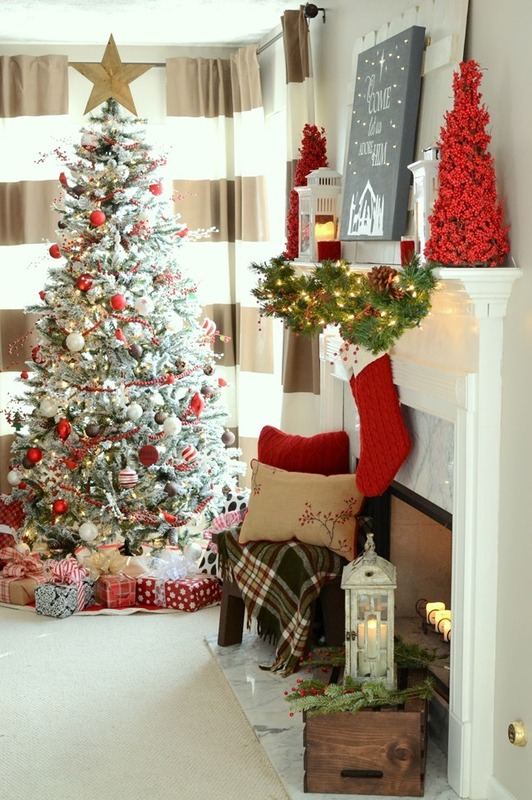 So my thought process in choosing a theme or figuring out what I want to do with my decor is coming up with a focal piece (usually what’s on the center of my mantel) and then a color/or theme that I can incorporate touches of in my tree and other decor. 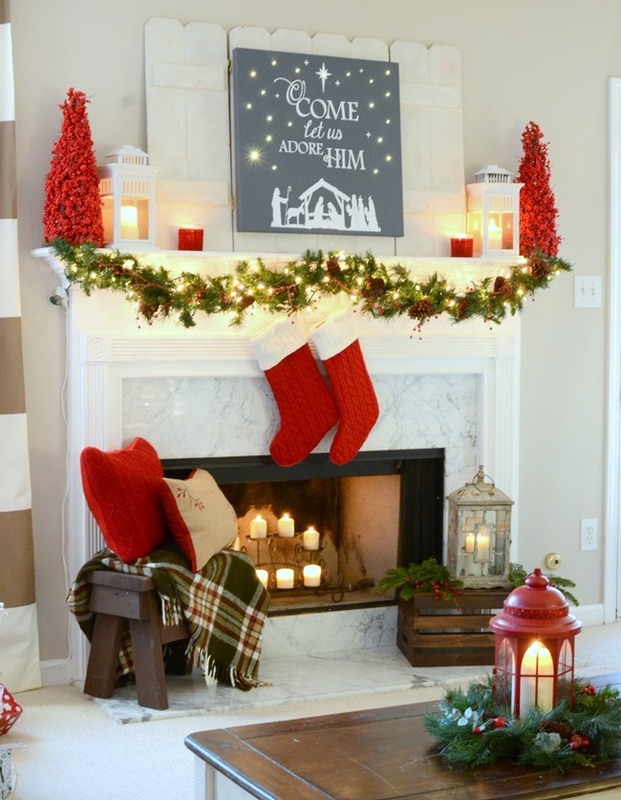 By changing up the focal piece on the mantel and taking away or adding a new color or ribbon or “theme” such as plaid or burlap it completely changes up the whole look and I can still use all my other same pieces around it rearranging them in different spots or ways to give a new look. 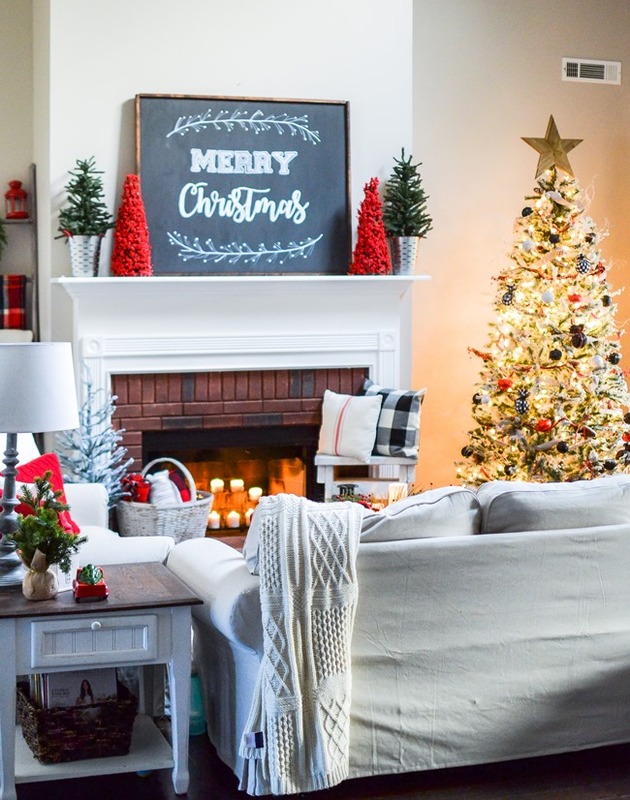 I begin planning early – honestly starting to think a bit about my Christmas decor early September – now some of that is the blogger in me because I know I need to come up with something fresh to help inspire you and also because I usually start decorating earlier than most people. I will browse Pinterest, walk the aisles of Hobby Lobby and then just consider what I am loving that year. I also take into account if I got some new piece of decor that previous year on clearance after Christmas or some amazing yard sale/thrift store find I want to incorporate. 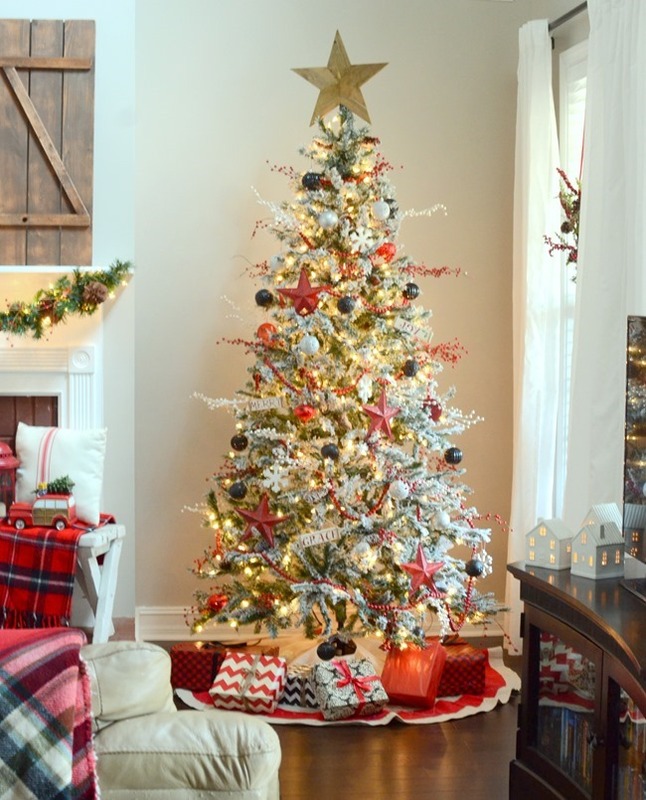 I love some of the trends just like you like the buffalo plaid, red trucks, flocked trees so I try to incorporate what I love that’s popular that year too. 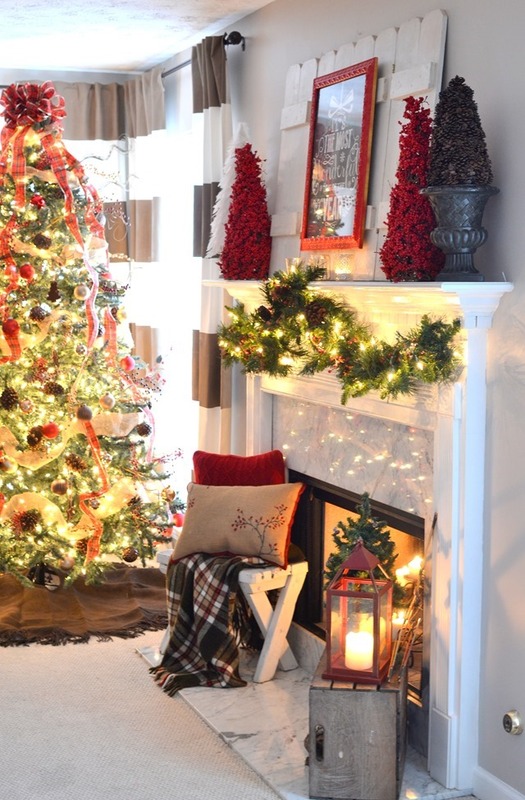 When I begin decorating I usually start with my mantel and once it comes together, I know which direction I want to go with my tree and then the rest of the decor just flows from there. Pillows get used in different spots, throws get used or stored depending on color or theme, and I mix up all the rest of my decor. Another thing I do is even now, during the season, I will take note of things I love in other people’s decor or maybe in stores and add them to a list in my phone of things I want to try to find after Christmas on clearance. I did a whole post last year on how to I save big shopping after Christmas clearance, not just on Christmas items but on things I can use all year round. So in some ways, I begin working on my “theme” a year ahead. For instance this year I would really like to find snowy berries, and snowy picks with pine needles and pinecones to add to my tree for next year… If you are loving the flocked look but don’t have flocked stuff, try to find some clearance pieces after Christmas for next year or buy some flocking powder and flock some of your current things. I hope that helps! I know that my approach may be a bit different because I am a blogger so it’s sort of my job to change things up each year, but, even if I wasn’t blogging I would still change things up! 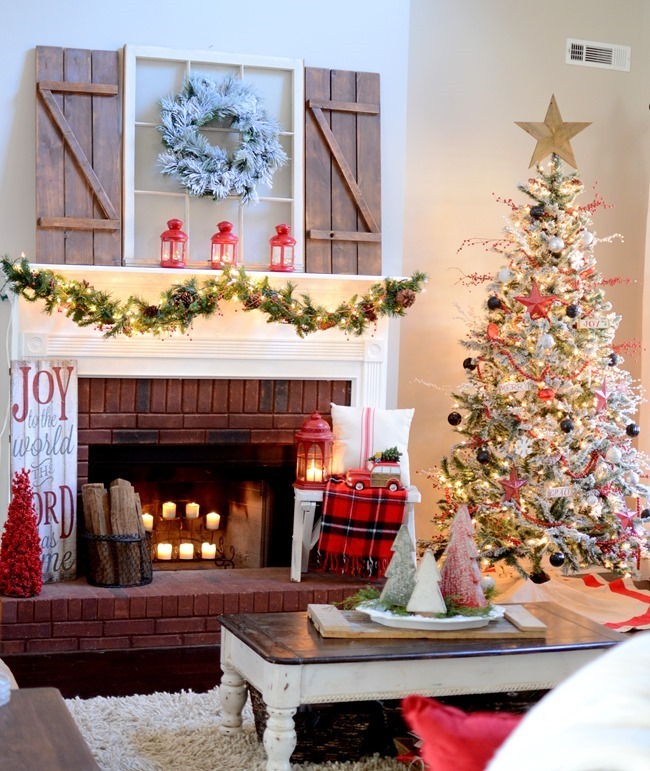 I absolutely do not want you to go buy all new decor each and every year and I don’t either… what I want to inspire you to do is to invest in staple pieces (like a nice tree, wreaths, some nicer/bigger decor) and then by rearranging or just adding 2-3 new things each year freshen up your staple pieces. And absolute bottom line, do what you LOVE! If you have a tree loaded with family ornaments that’s always decorated the same, then you do you! I honestly can’t wait for the tree with all the sentimental, homemade ornaments but since my daughter is just two we don’t have that many yet. Need to work on adding some sentimental/homemade ornaments this year! 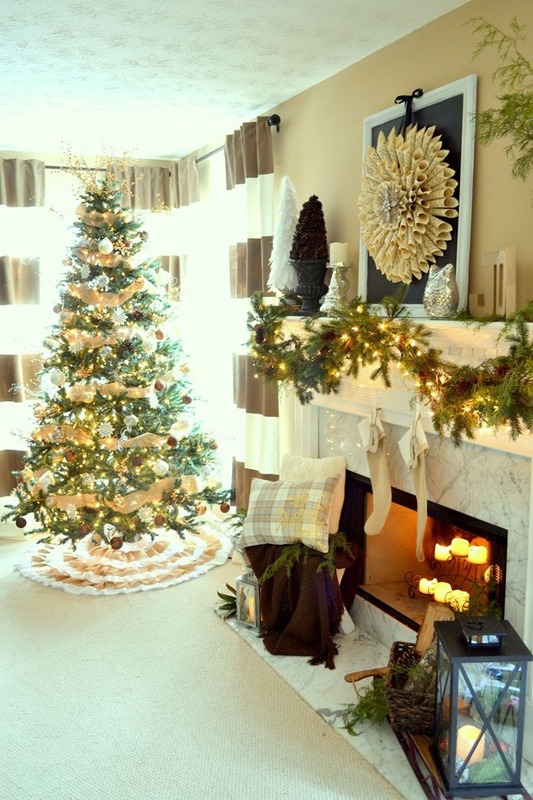 I’d love to hear what you do with your decor – do it all the same each year? change it up completely each year? look for clearance deals for the next year? What’s your favorite colors or themes to use? It seems like I put things in different places each year… But it takes me a long time to decorate that way. I’d like to be more efficient…. But last year I splurged and bought bright colored garland on sale after Christmas just because…so now I have to decide where to put it. I’m also thinking to “style my sink” area which is something I hadn’t thought about doing before now. So, a lot of thinking to do…. And since I love color, it’s hard to coordinate the traditional reds and greens with my love of purples and blues!! I probably need serious help! But part of the problem is having a lot of those sentimental ornaments and gifts from students over the years…. Seeing your smooth transition from year to year is neat to see. Thanks for sharing! You’re holiday decor is always beautiful! I was in a rut for several years, using mostly the same stuff every year in pretty much the same way. Recently I decided to move things around and change it up, get rid of things I was tired of, but add few new items here and there (mostly on sale of course! ), and also remember that I don’t need to get everything out every year! I painted my fireplace this year so i’m really wanting to change things up there. I also decided to put up a different flocked tree with berries I got a few years ago on sale. I love ornaments that reflect my families interests. We have many that represent my kids favorite activities (dance, music and basketball), our pets, favorite sports teams, and vintage style ones of favorite characters/icons (I adore cardinals, snowmen and gingerbread people). I also like to pick up ornaments on vacation as a reminder of the trip. I have even purchased pretty keychains on vacation used as ornaments! My tree may be very multi-colored and eclectic, but I love the memories it evokes?? I do, as much as possible, stick with a color theme of red, green, and gold, with a vintage/retro theme. I love your ” O Come let us Adore Him” sign! What would we do without Jesus! 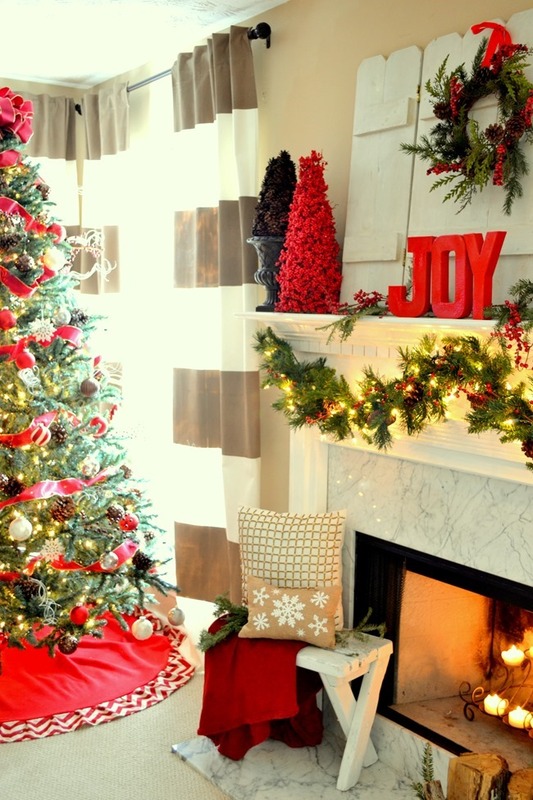 I do some of the same decorating every year just because I love it and I hope it will bring back happy memories for my adult children and grandchildren in years to come. I display the Christmas story on my mantel and tell my grandchildren every year, the Christmas story and follow along on the mantel. I have the nativity scene, 3 wise men on camels, and a porcelain Joseph, Mary and baby Jesus on a donkey entitled Flight into Egypt. I want them to know the true meaning of Christmas. On a dresser in my living room I have a metal tree that holds all 7 of my grandchildren ornaments with their names on one side and a special grandson or granddaughter on the other side that I would order whenever one was born. I also have candy jars filled with various candies and candy canes for my “candy shop”. In my dining room I set up my snowmen display. I have much more but have no where to put it and it’s hard to part with any of it, although I’m going to have to, but I love everything about Christmas, especially because Jesus came to this earth and gave us a reason to hope! Love your décor as well. Beautiful!